With the end of the year rapidly approaching I thought I'd run down the 10 best things I ate this year. I have presented them chronologically as it was too difficult to rank them 1 to 10 given the wide disparity between the various dishes. I consider myself extremely lucky, visiting Frasca right as Chef Mackinnon-Patterson is preparing for a local competition called Cochon 555. 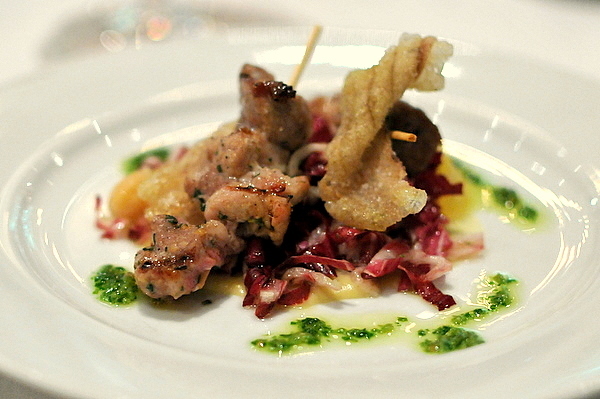 Dubbed a "touring porcine bacchanalia-slash-competition" consists of 5 chefs, 5 pigs, 5 winemakers. As a result, the kitchen at Frasca has benefited from a plethora of heirloom pork to work with, in this case an acorn-fed Berkshire variety. Spiedino translates to skewer or kebab and indeed the pig is sublime, firm and nuanced texture with just a slight fatty tenderness. The slight oily sweetness is offset by a lovely vegetal tang reminiscent of a salsa verde. The salad added some texture and moisture but the pork effortlessly stands on its own. The core of this dish is a pork belly confit that turned out tender and surprisingly well balanced especially in conjunction with the swoosh of celery root puree. The sauce was a concoction called "umami butter," an utterly decadent combination of aged cheddar, burre blanc, soy, sake, and shiitake mushroom. 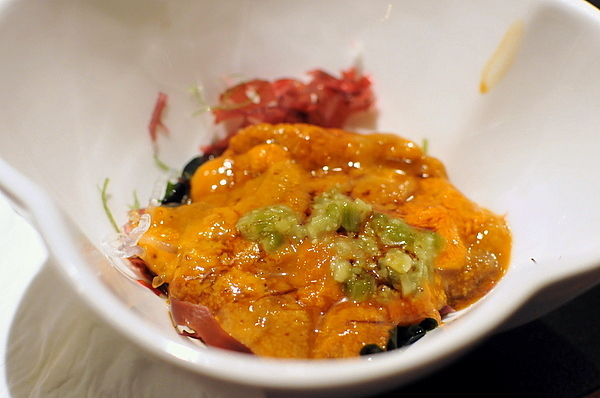 The topping was a miniature new style sashimi preparation with Tiger Shrimp, ginger and chili that still managed to stand out against the heavy. It is this masterful balance between the disparate flavors that made this entry by CdC Jensen Cummings the best dish of the night. This course is marvelous plain and simple. 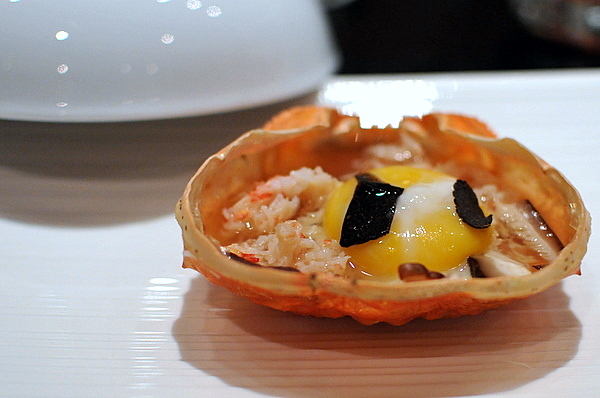 Kevin compares it to the hairy crab at Urasawa which he labels the best thing he ever ate there. The shredded crab comes in a shitake broth, its umami-tinged earthiness a welcome foil to the crustacean's natural sweetness. The yolk adds a deluge of viscous runny goodness that gives the dish a silky satisfying weight on the palate. 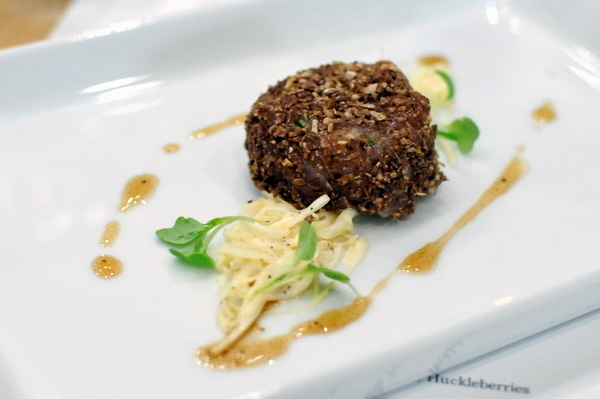 The black truffle shavings add a final punctuation of luxury and complexity to the dish. There is something satisfying on a primal level about eating meat with your hands, feeling the rush of of iron-tinged meat jus that gushes forth as you tear the rare flesh from the bones. Without question the lamb chops stand on their own; exquisitely seasoned with an immensely delicious marinade of cumin and sumac. Next time forget the fancy decorations on the plate and give me another piece! This was probably the most intriguing course of the night; the various elements work in perfect concert to create an edible "forest floor." 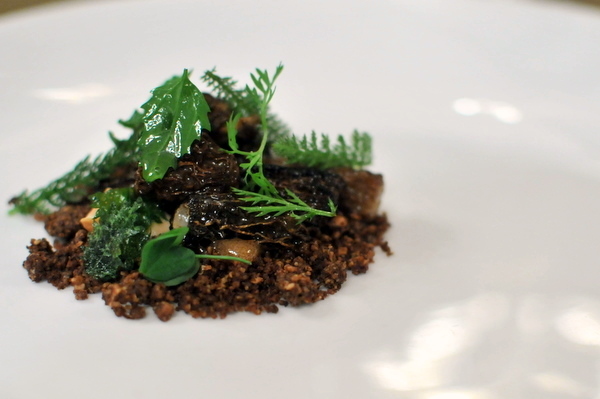 the sappy sweet aroma of pine is immediately evident in the soil and taken with the morels enhances the profound earthy smokiness of the mushrooms. The trio of greens: stinging nettles, wood sorrel, and yarrow add an herbal vivacity to the dusky weight of the fungi and soil. 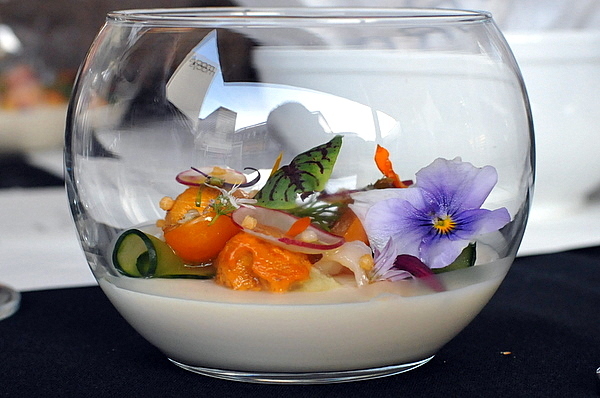 Visually this course was nothing less than a work of art and if anything it tasted even better than it looked. Hidden under the foliage were generous pieces of sweet creamy roe. 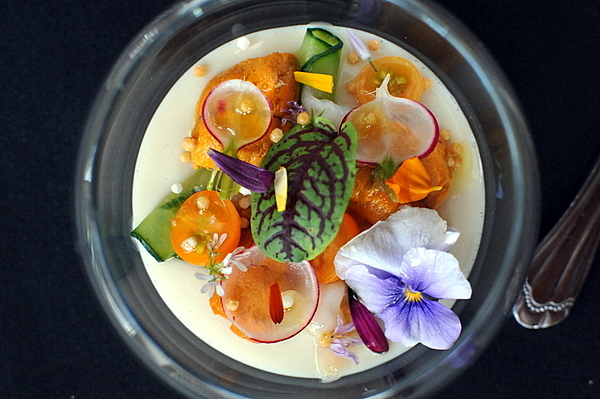 The flavor of the uni simply resonates through the panna cotta leaving a lingering essence of the sea on the palate. Hands down this was the best course of the evening and it might rank as one of the best things I've eaten all year! From the conception, presentation, and execution this was easily one of the most impressive desserts I've ever encountered. The story behind the dessert is a olive fresh off the tree. 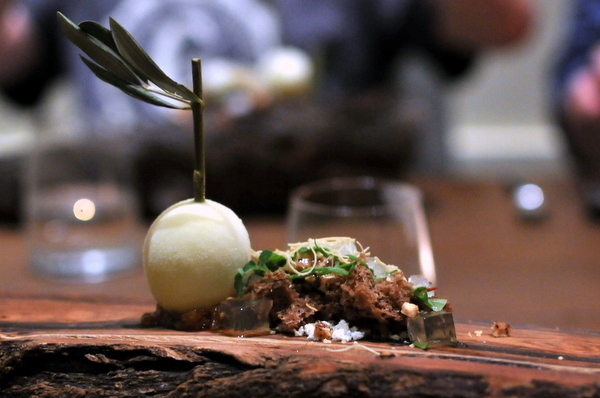 Instead of a true olive the focus of the dish is an EVOO ice cream reconstituted on an olive branch. Accompanying the "olive" are a lemon ice, fennel jam, and almond nougatine. Don't as me how it works out so well, but combination is absolutely spectacular. Easily the best dessert I've eaten all year. I don't know what how the chef came up with the name but the dish itself consists of the most seductive flavorful tuna tartare that I've ever had. 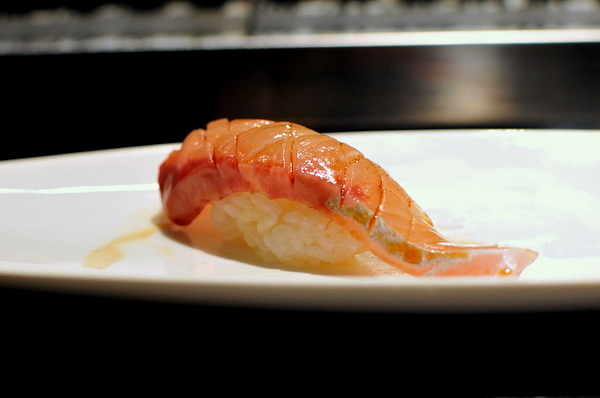 The bright red flesh was torn by a scallop shell then mixed with a roasted blend of fish fat and sinew giving the mixture an extravagant oily char reminiscent of grilled toro. If that weren't enough the dish was paired with gelee made from marrow extracted by boiling fish bones and white soy sauce that gave the dish a lighter more savory brine. A rice cracklin topped with shrimp floss and river vegetables provides a brazenly salty textural variance. 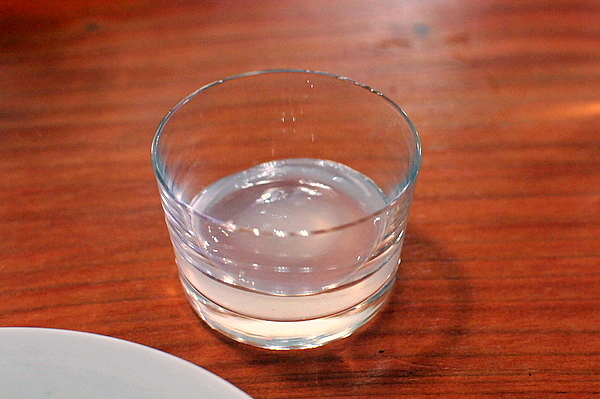 The third component was a shot of spinal jelly that we were told to eat midway through the course. 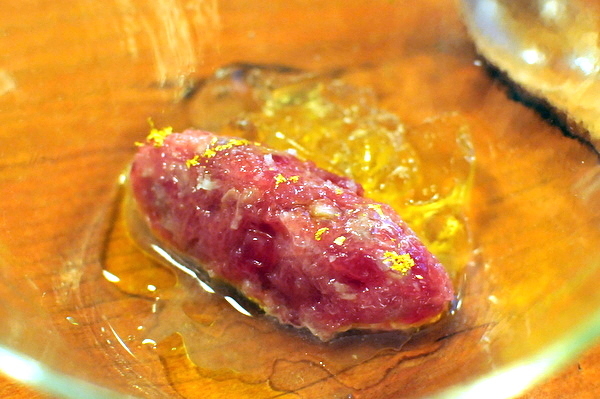 With a flavor like a muted saltwater, the jelly helped reset the palate between bites of the tuna. This was so good we asked for seconds. 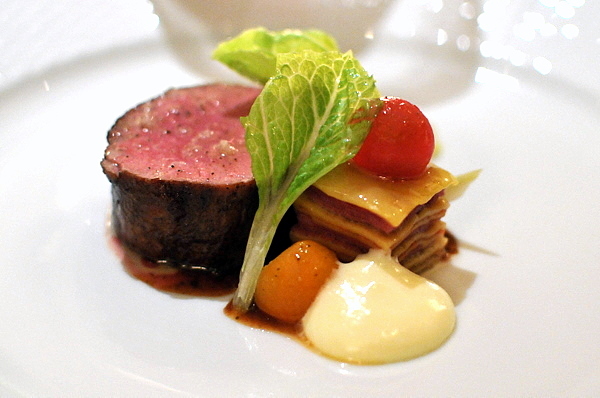 The French Laundry | MARCHO FARM NATURE-FED VEAL - "Lasagne de Langue de Veau," Toybox Tomatoes, Globe Artichoke, Romaine Lettuce and Castelmango "Mousseline"
The veal's sheer profundity and depth of flavor coupled with its exquisite texture was nothing short of magnificent. The lasagna of veal tongue provided complex nuances of a robust and slightly piquant salinity while the verdant succulence of the lettuce and sharp zing of the tomatoes added a contrasting levity to the meat. 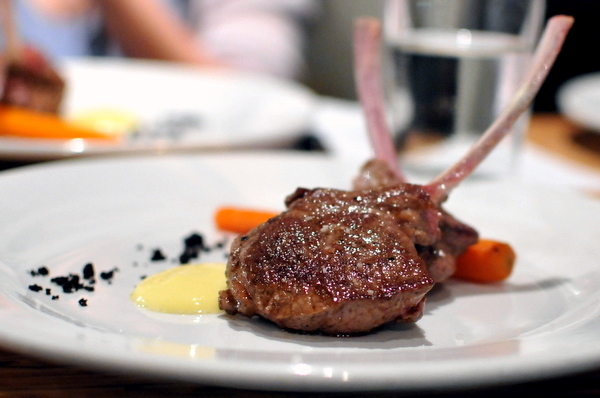 I used to wonder what all the hubbub about veal was; leave it to Keller and his crew to open my eyes. This was my first time having raw rabbit and hopefully not the last. 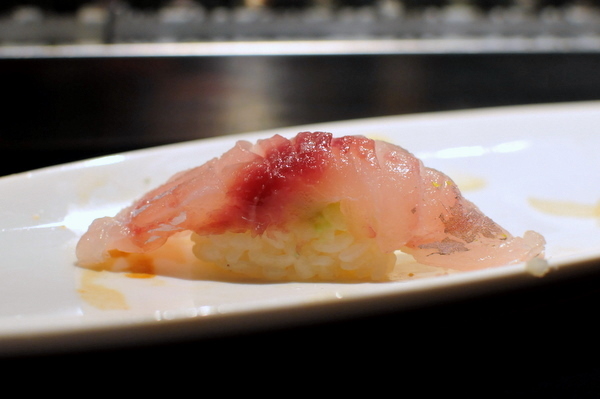 The texture and flavor reminded me of a hamachi enlivened by a peppery kick and the heavenly aroma of white truffle. The celery root added a sense of complexity and contrast to what was already an immensely delicate and satisfying course, making this my favorite of the night. As an aside, the dish proved so beloved that Laurent brought it back at a subsequent LQ@SK dinner, something he never does. 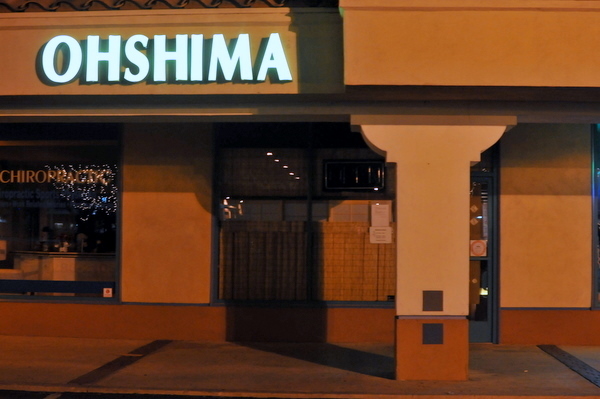 When a discussion about the best sushi in the OC comes up, I invariably mention Oshima as one of the candidates so it's hard to believe I've never written about the place before. 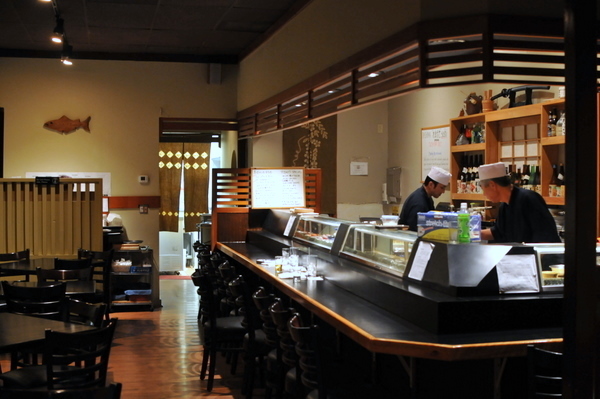 The restaurant is the prototypical strip mall sushi joint, very little exterior decor except for the name. The interior is equally cookie cutter with Japanese wood paneling, a handful of dark wood tables and a 10-seat bar that is omakase only. 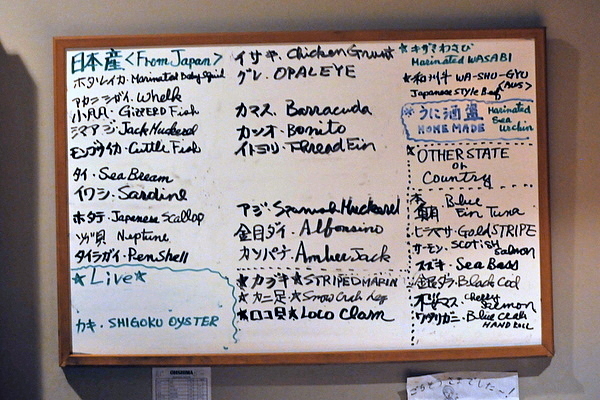 Naturally I didn't come to Oshima for the decor, but for the food particularly those items on the "From Japan" board. 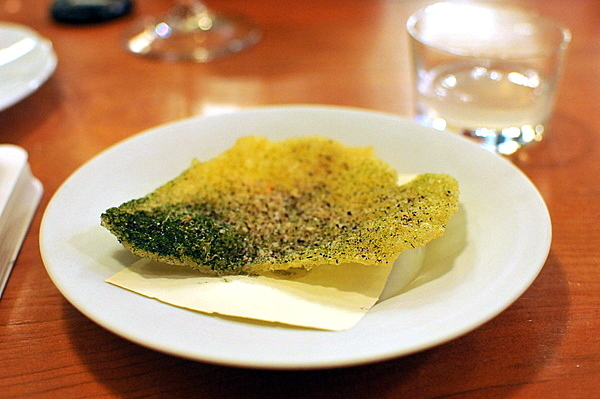 The meal started with a small dish of boiled radish and seaweed. 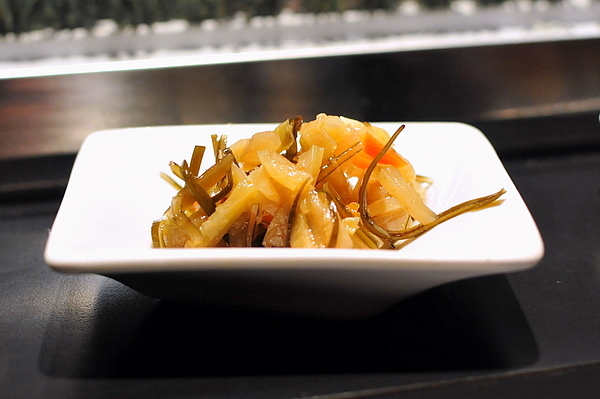 The root vegetable sweetness is quite intense but the seaweed does provide some savory contrast. 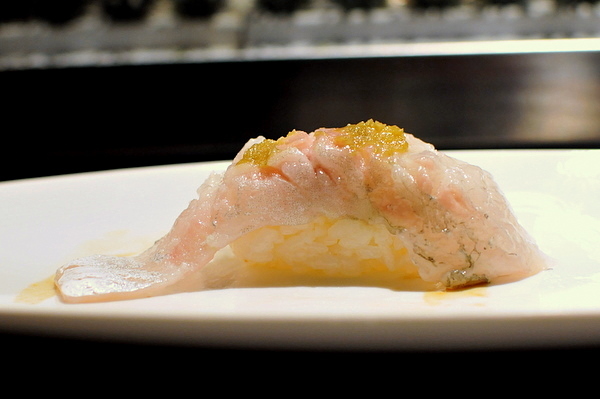 I've noticed that tai is a common opener to omakase dinners and Oshima use classic citrus and sea salt accompaniments to add flavor to the firm but mild flesh. 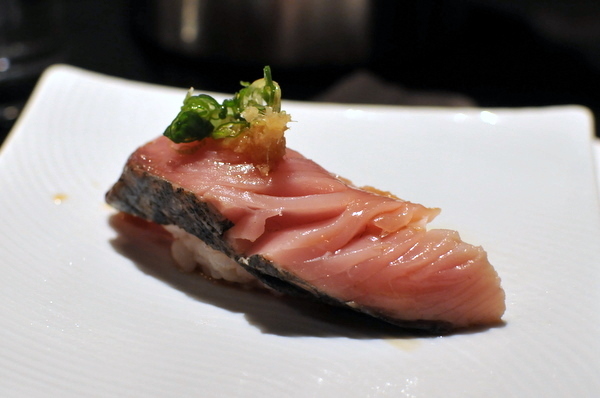 This was a solid example of bluefin, the fish displays a uniformly smooth texture utterly free of sinew and gristle. 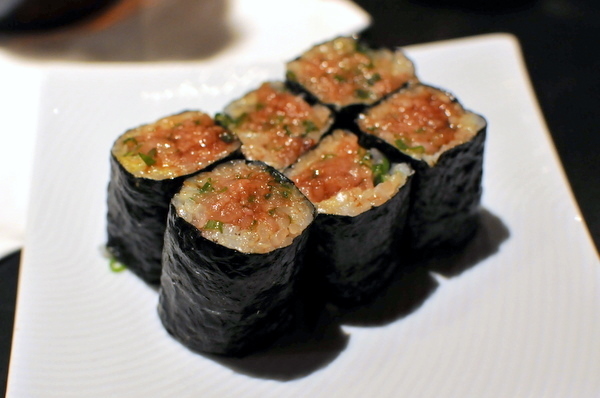 I have come to appreciate the simplicity of tuna though I don't know if I'll ever prefer it to its richer cousin toro. 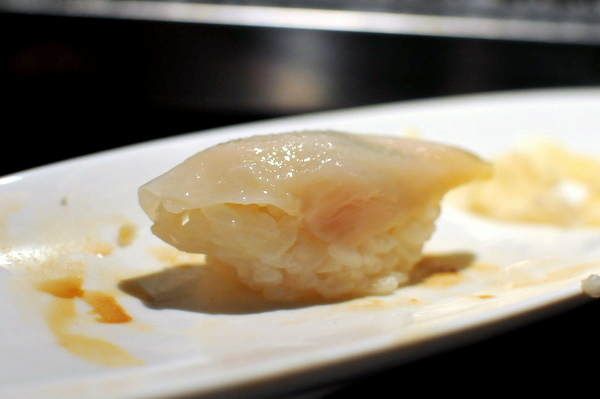 Its been a while since I've had scallop nigiri so I especially appreciated its tender jellied consistency and the lingering essence of shellfish though I wouldn't have minded some salt or yuzu kocho for emphasis. I tend to think of salmon as an "American" fish, but Cherry Salmon is a variety that lives in the rivers of Korea and Japan before returning to the Pacific to spawn. Adults have a beautifully vivid pattern of black and red stripes along their bodies. 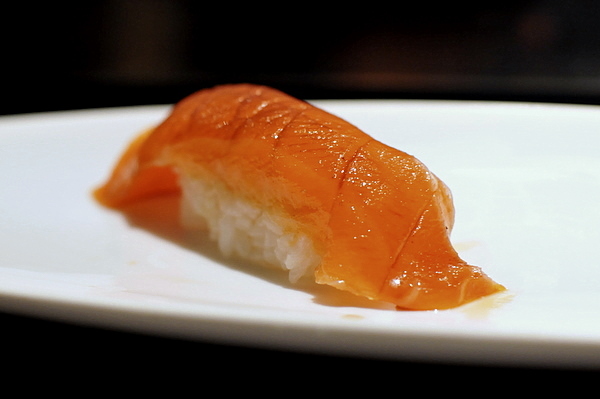 The flesh has a deeper uniform orange tone in contrast to the more common orange and beige bands of common salmon nigiri and is perhaps a touch firmer. The flavor is substantially different as well as I detected an overwhelming essence of spring onion coming from the fish, quite nice! The sea bass was one of my favorite pieces of the night, the tender fatty texture feels wonderful on the palate and the mild flavor of the fish is augmented by the spicy-sour punch of yuzu kocho. 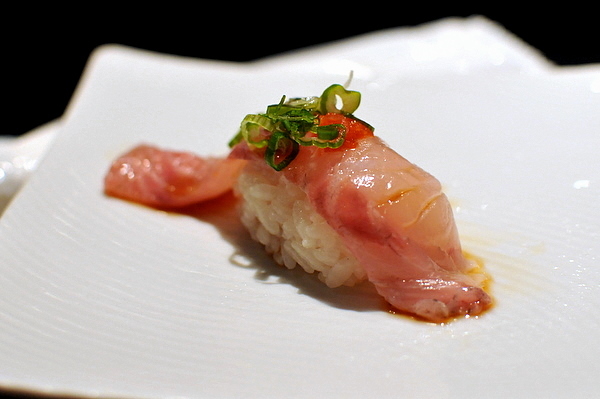 Once a favorite, Kanpachi has since been superseded by more obscure fish like Shima Aji, still a good piece of Amberjack can be quite enjoyable. 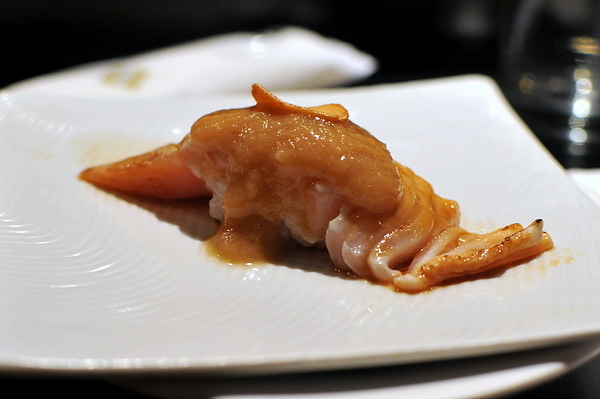 This was a prototypical example of Amberjack, taut yet slightly gellied with a hint of satisfying fish oils. The Grunt family of fish is named for the sound it can produce by grinding its teeth and the Chicken Grunt species is found along costal waters from Japan to Northern Australia. 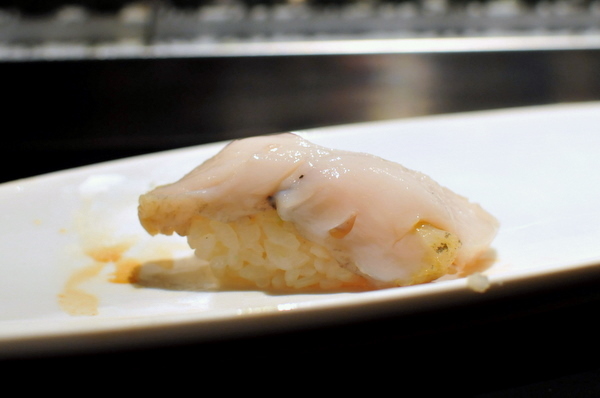 The fish looks a lot like kurodai or black snapper, but has a denser slightly snappy consistency. The flavor is perhaps a touch more apparent than tai or hirame, but still relies mostly on the ponzu as well as the scallion and radish. A blend of yuzu juice and sake, this is like a more delicious version of a kamikaze thanks to the expressive citrus notes that accompany it. 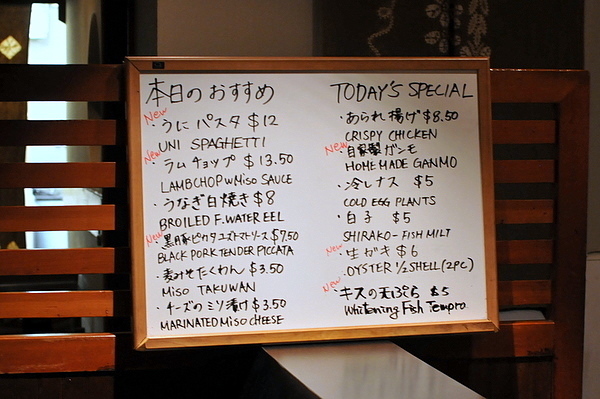 I think I've only had raw Pen Shell Clam once before at Maki Zushi, though they referred to it as Halfmoon Scallop. 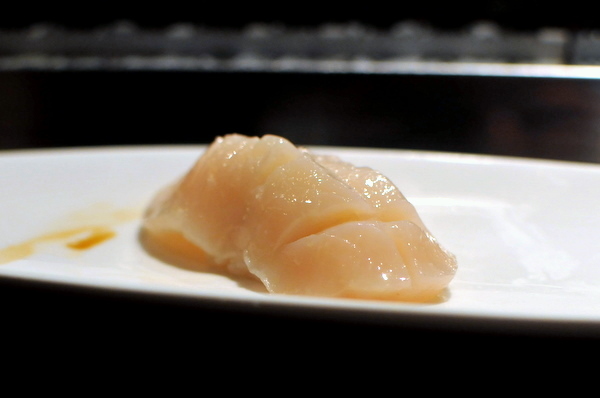 The flesh has a slightly yellower hue than the more common scallop as well as a firmer denser texture and more aggressive salinity and I would have liked a sprinkling of salt and citrus to help balance the flavor. 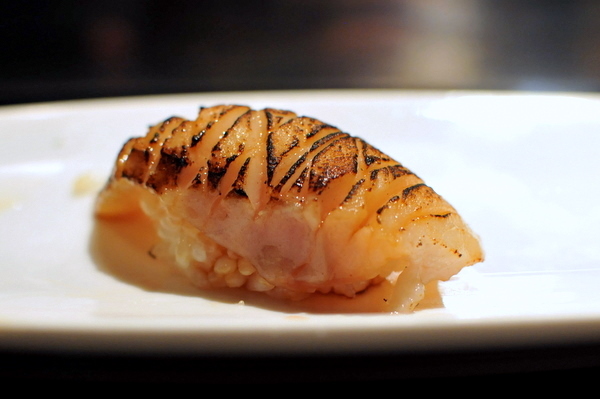 I've enjoyed my share of black cod with miso but there is something to be said for this simpler preparation. No seasoning or sauce, just a bitter char which plays very well with the fish's inherent fattiness. 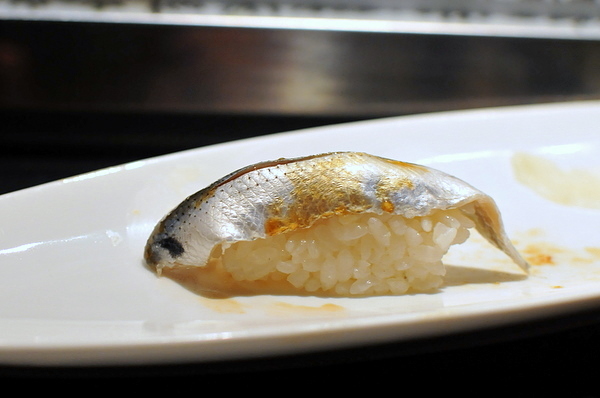 Aji is another of those fishes that I use as a yardstick for sushi restaurants. Oshima's was firmer than most with barely any oiliness to speak of and what the ponzu and scallion masked what little flavor there was. 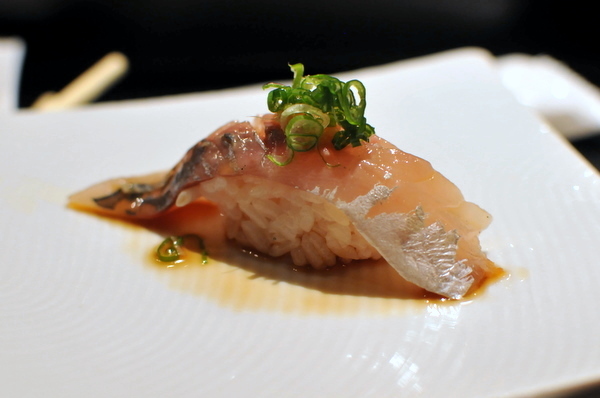 The fish was enjoyable, just not what I'd typically associate with Aji. 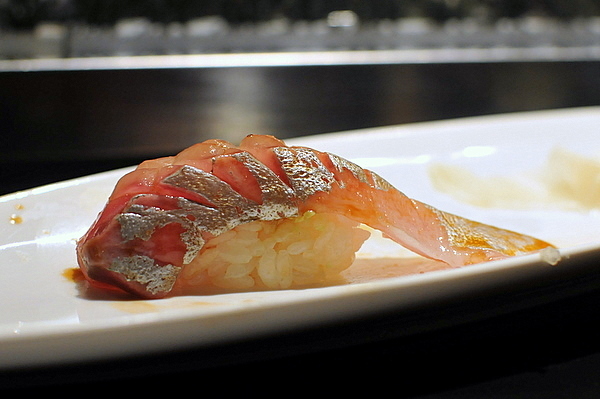 I've never heard the name Golden Stripe before, all I knew was that Hiramasa was an Australian cousin to yellowtail. 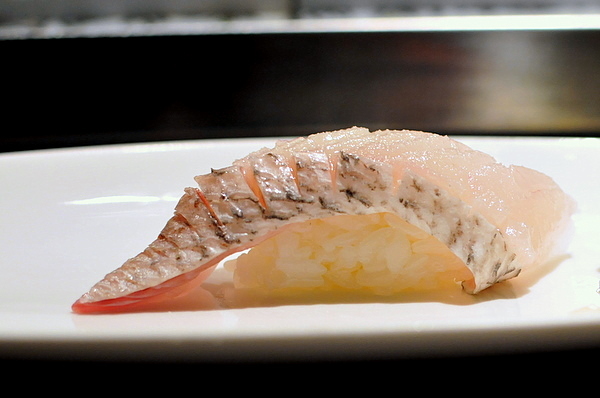 I had the fish a number of times spring of this year and found it to be a bit fattier than regular Kanpachi. This time around I wasn't able to detect much difference from the Amberjack above. The albacore belly comes doused in a "secret sauce" and topped with a fried garlic chip. 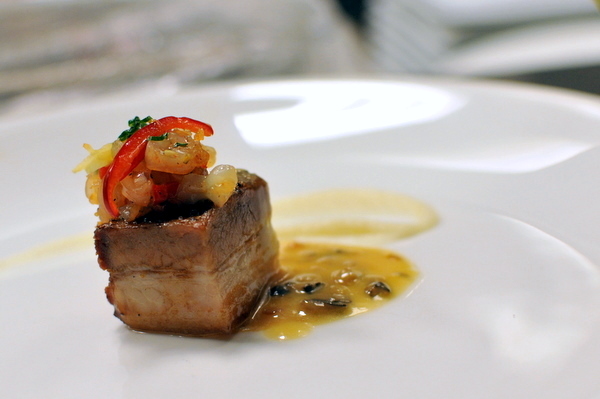 Though the seared belly exudes a buttery smokiness the flavor is lost on the palate, drowned by the garlic and sauce. Oshima forgoes the traditional seaweed wrapper around their uni, noting that uni should stand on its own and having the unbridled sweet brine of the uni I was inclined to agree. 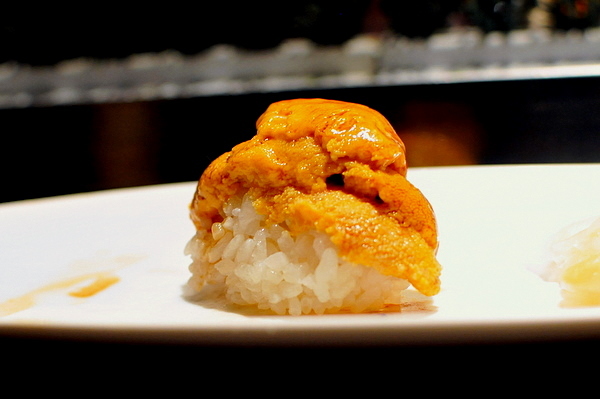 Our chef boasted "Uni Number 1!" and though I have had better, Oshima's is certainly up there. This is my first experience with this species of oyster. A Pacific oyster from Willapa Bay, Shigoku ("Ultimate" in Japanese) are a sustainably farmed variety developed by Taylor Shellfish in 2009. The oysters are compact, dense, and simply delicious. For me, these oysters redefine sweetness when it comes to shellfish. Though a single oyster is not enough to make a fair comparison, in time I think Shigokus may dethrone Kumamotos as my favorite oysters. After trying the fresh uni I was curious about their marinated uni. 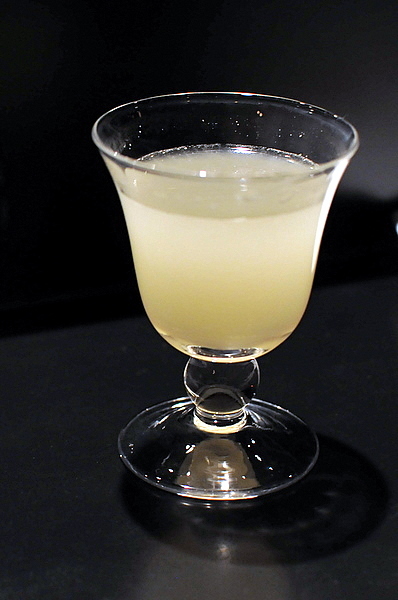 Compared to the regular version, the marinated variety lacks the explosive sweetness and has a lingering bitter brackishness. The one saving grace was the fresh wasabi which gave the urchin an added bite. 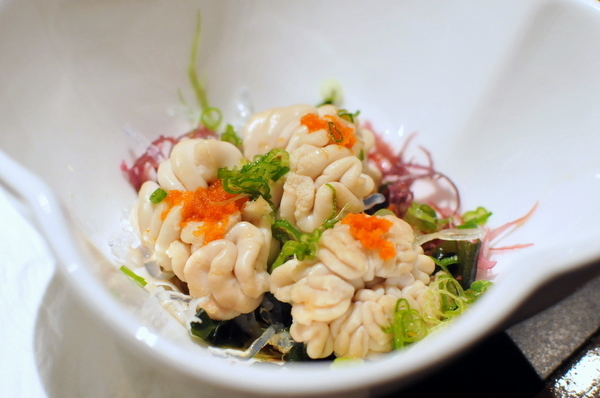 After raving about the Shigoku, our chef asked us if we wanted to try his "favorite" and we naturally said yes. 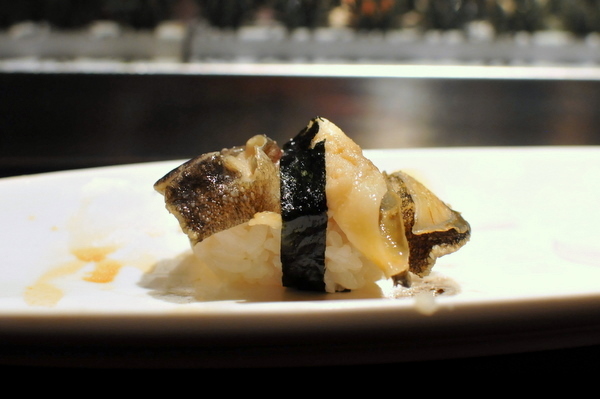 It turned out to be shirako which I noticed had a lightly salty boiled egg essence to it. Though I've had shirako before, this was the first time that I'd seen it with this wrinkly brain shape, before it always looked like a formless ovoid. 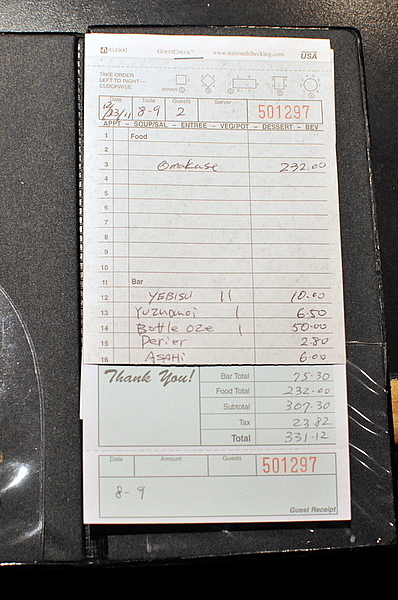 Prior to this I've only had Barracuda at Mori Sushi and both times it was blowtorched. Without the extra dimension the fish was a bit bland, though the texture was unique: muscular and sinewy on on end then soft on the other. Having read lots of good things about the beef, we opted to try it in sushi form rather than as a hot appetizer. Basically a delicious sliver of steak, the meat has a nice beefy sapor, but again the sauce and garlic chip feel a bit heavy handed. I don't even know what this but I want more. The snap was reminiscent of a razor clam, crunchy and cartilagenous while the flavor has a deeper bitterness than the earlier scallop. 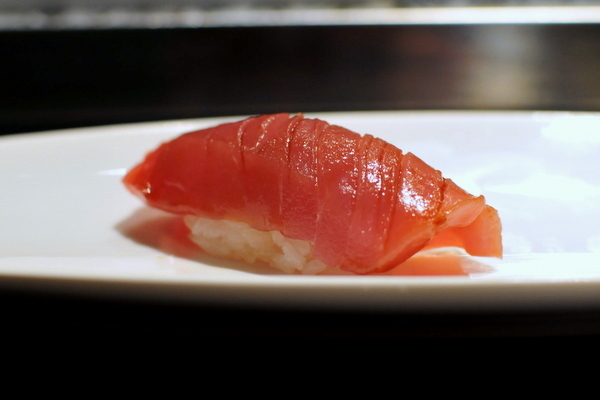 Bonito is a type of tuna, the flesh is pinker with a bit more fat and flavor. 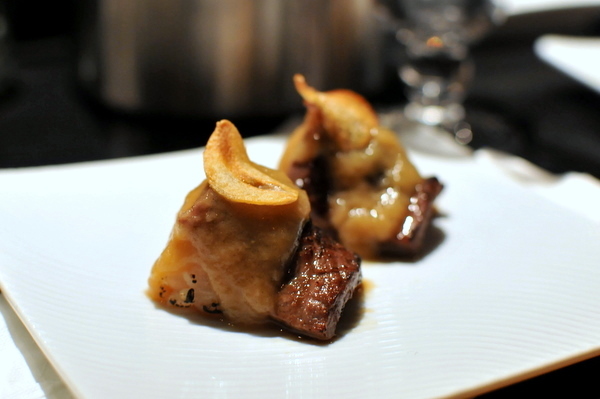 The result is a slightly smoky essence and a meaty texture that that dissolves on the tongue. Like the more common Conch, Whelk is a form of sea snail. The texture is very much like an overcooked steamed clam with a correspondingly earthy bitterness. This is another new fish for me. A quick Google search, lists this as a Snapper variety. 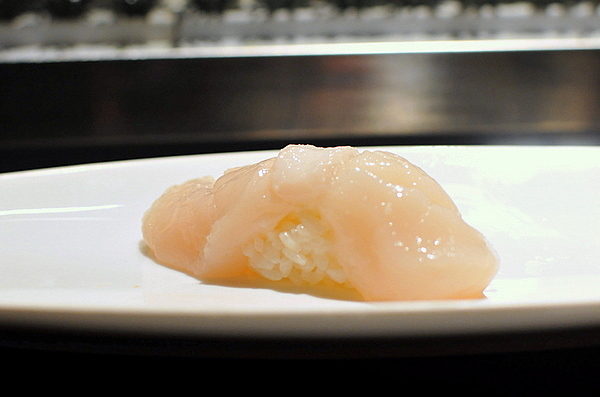 The texture is softer and more uniform than traditional tai but the same mild flavor is there. In fact the citrus and salt explode on the palate with this fish. Referred to as Loco Clam, Horagai is actually a large conch. 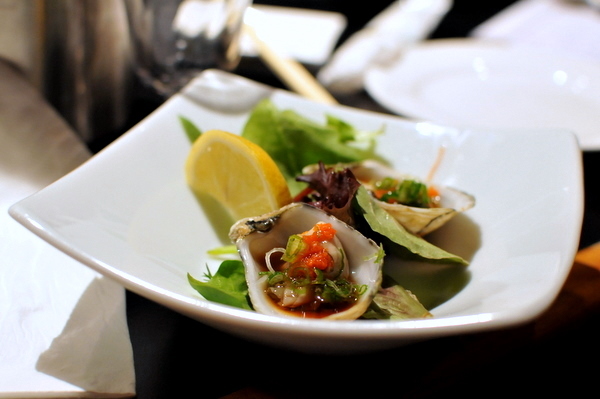 The clam looks meaty and pliant, but the texture was surprisingly dense and compact, reminding me of sangaki. This was my first experience having seared Golden Eye Snapper. Again I enjoy the bitterness and I think cooking helps separate the flakes of the fish as well making the whole thing quite tender, a nice contrast to the crunch of the charred rice. Through 20+ pieces of sushi, we'd had surprisingly few examples of oily fishes so we decided to order some sardine to shake things up. The silver skinned fish exudes a pungent oily musk tempered by a bit of citrus. At this point we saw Shige open a new pack of toro so we had to try it. 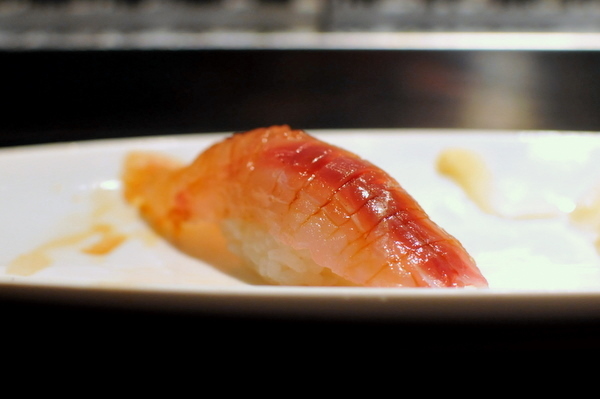 Shige handles the toro himself, removing all the gristle and leaving behind a quivering piece of fish butter. After 27 pieces we were still hungry so we opted for a pair of hand rolls hoping the rice would help fill us up. 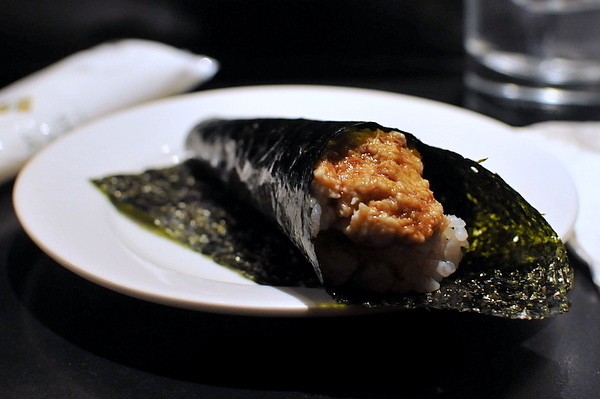 Instead the roll is mostly creamy sweet crab, fairly typical but tasty. 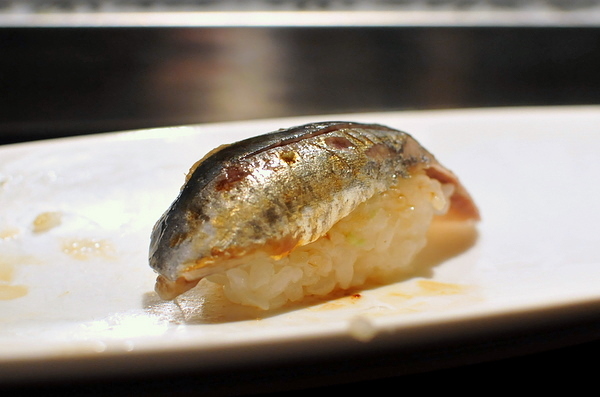 Like the sardine, Kohada is an oily silver skinned fish. The tiny silver sliver has a texture that feels almost dry while the flavor is unabashedly fishy, definitely an acquired taste. 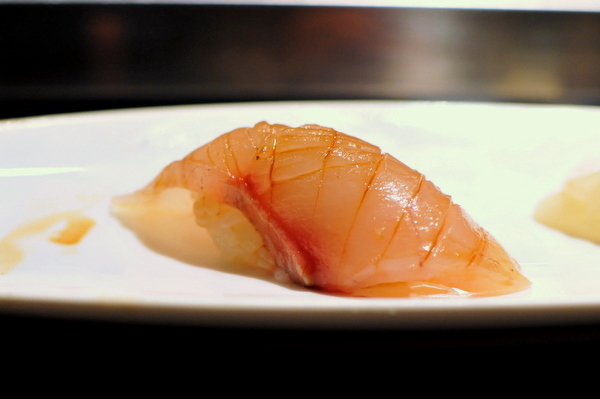 Shima Aji has become a must try fish for me after I first had it at Urasawa. Surprisingly the fish has remained consistently delicious, perhaps some self-selection bias at play with only good sushi bars stocking the fish. This ended up being my favorite of the night thanks to its nuanced oily flavor and sensuously slick fleshy mouthfeel. 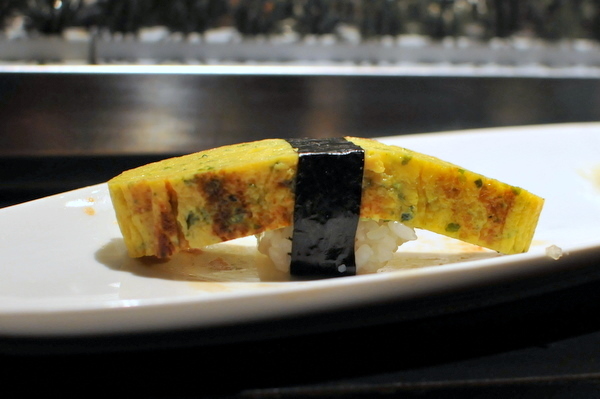 The traditional closer to the meal, dense eggy sweet with a hint of seaweed. At the end of the night, the chefs posed for a picture. 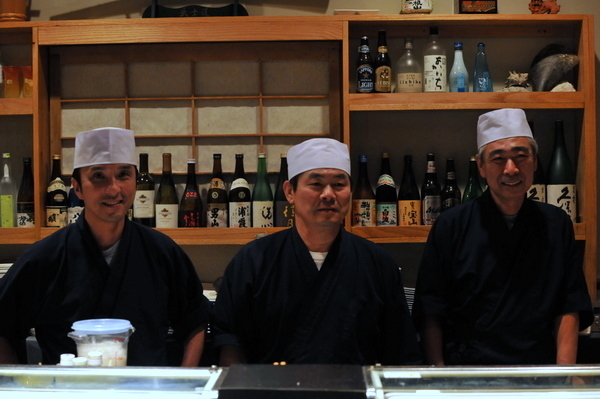 From left to right we have: our chef Yuji, Miki, and the owner Shige. As I said before this is my third time here and the restaurant never fails to impress. 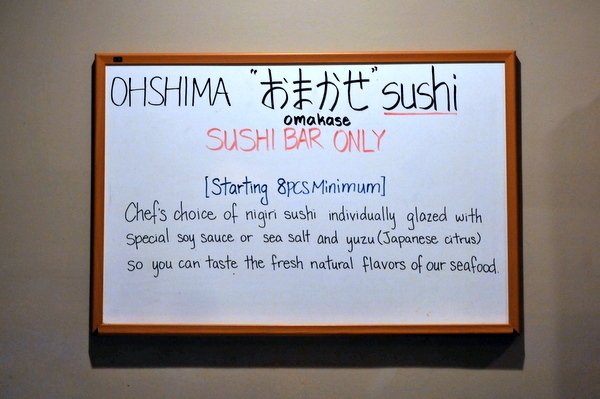 If anything Oshima has taken some positive steps to be a more authentic sushi experience such as eschewing the medley of rolls popular with the American crowd. 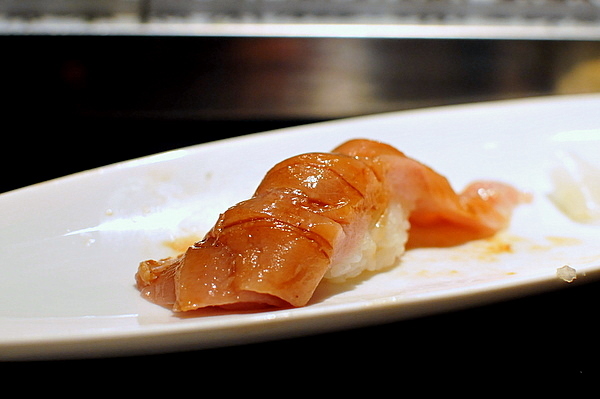 The restaurant still maintains a fairly substantial cooked menu and some items are reported to be quite good, but the star is definitely the nigiri. 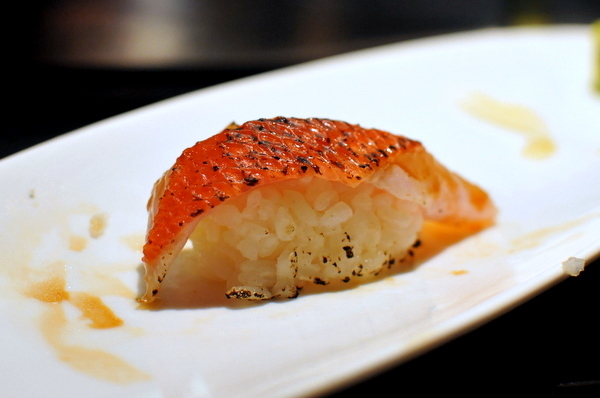 Bottom line: Oshima is as good of a pure sushi experience as you are likely to find in OC.